A man has told a court he threw the first punch when violence broke out in a south London street which left a Kurdish student seriously injured. 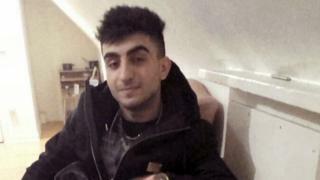 Reker Ahmed was left with a bleed on the brain and a fractured spine after the assault in Croydon on 31 March. George Walder told Croydon Crown Court he was "angry" and had punched one of the 17-year-old's friends but he never hit or kicked Mr Ahmed. He and five others deny the charges against them. Mr Ahmed was chased and attacked twice over the course of 16 minutes near The Goat Pub shortly before midnight. Mr Walder told the jury he had been surrounded by "two or three" people who were trying "to get" him when he came out of the pub. The 21-year-old said he did not know what had been said before he hit Hamo Mustafa in the face "but it was aggressive" and he added Mr Ahmed had also tried to punch him. He also told the jury he now felt "embarrassed and sorry" about throwing the punch at Mr Mustafa. Prosecutor Jonathan Polnay told the court Mr Ahmed got an "absolute shoeing" and that Mr Walder was part of the "pack" which attack him. But the 21-year-old said he only chased Mr Ahmed because the 17-year-old had taken his hat and he denied attacking him.